Checking your barbecue for gas leaks is easy to do and should be part of your routine maintenance to ensure that your grill is proper working order. Gas leaks are typically caused by a loose connection or damaged gas hose. Connections can become loose over time or may not have been properly fastened to begin with. Gas hoses can deteriorate over time and crack or split, or be damaged by animals such as mice or squirrels chewing on them. We recommend that you check for leaks each time you connect your regulator or natural gas hose to the barbecue, or after long periods of storage such as in the spring. Make sure your gas supply is turned off and all control knobs are in the OFF position. Mix a 50/50 solution of water and dish soap and apply it to the gas hose and connections points with a spray bottle or with a clean brush. Open the gas supply, but do NOT turn on the control knobs or light the grill. Inspect the hose and connection points. If you see see growing bubbles forming at any point this is indicates a gas leak. If you discover a leak on the gas hose itself, the hose must be replaced before using the grill again – this is a fire hazard. If you find a leak at either connection point, disconnect the hose and reconnect it, making sure that the fittings are not cross-threaded. 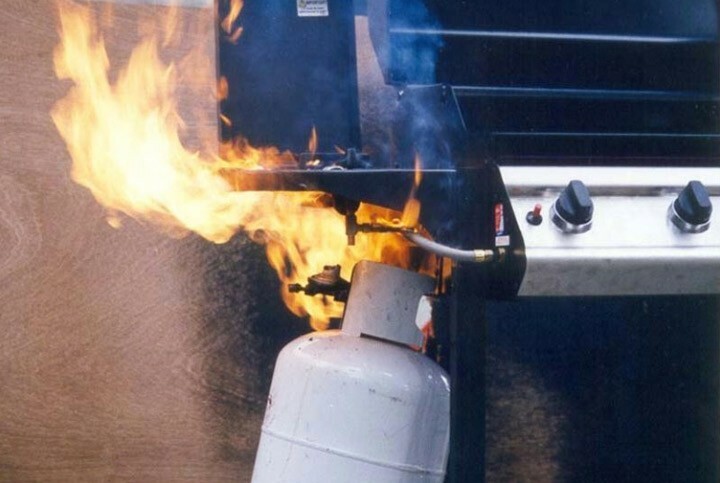 The connection between the regulator and propane tank should be tightened by hand, while the connection between the gas hose and the manifold should be tightened using a wrench. Once complete, we recommend conducting the leak test again to ensure that the connections are good. Find a replacement hose to fit your grill on GrillSpot.com or Grill Spot.ca!